Asked – Does a homeowner who abstains from voting in a HOA’s annual election have any impact on the degree to which the HOA satisfies its quorum requirement? Answered – Yes. A member that abstains from voting will still be included in measuring whether a HOA has satisfied its quorum requirement. Typically, a HOA’s governing documents (e.g., By-laws) will require that a quorum be reached for an annual election. 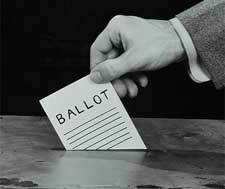 During an election period, a homeowner may choose to either vote or abstain from voting (an abstention). Although each abstention vote is included in determining whether quorum has been met, an abstention vote is not tallied for the purpose of determining whether a motion has passed or a director has been elected. Civil Code §1363.03(b). Accordingly, blank ballots and invalid write-in votes such as “Remove the Board” should also be counted towards quorum. It is not uncommon to have members abstain from voting. HOA Boards of Directors that are unsure of how abstentions or invalid votes will impact their annual elections should consult their legal counsel for guidance.